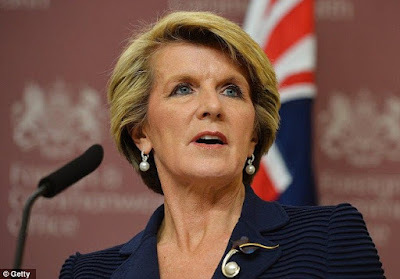 SYDNEY, Australia -- Ukraine's ambassador to Australia has raised concerns with Foreign Minister Julie Bishop over a Sydney-based travel company offering tours of Russian-occupied Crimea. Australia's Foreign Minister Julie Bishop. Gateway Travel has defended plans to take tourists on excursions around the peninsula, which was annexed by Russia almost two years ago in a move which prompted widespread condemnation among the international community. The Ukrainian Ambassador, Mykola Kulinich, on Tuesday wrote to Ms Bishop and also sent a letter of protest to the company. Mr Kulinich has raised concerns the tours would violate the position held by much of the international community, including Australia, in relation to Ukraine's sovereignty over Crimea which was seized by Russia in March 2014. "Crimea was brutally annexed and occupied in 2014 with Russian troops," the letter sent to Gateway says, also cautioning against "any steps that might be interpreted as recognition of (an) illegal annexation". Mr Kulinich has also raised concerns about the safety of would-be travelers. A spokeswoman for the Ukraine Embassy also pointed to the 2014 shooting down of flight MH17 over eastern Ukraine - a disaster in which Russia has been accused of involvement - that killed all 298 people aboard. " And almost 40 people called Australia home," the embassy's press officer Halyna Yusyiuk told AAP on Wednesday. The Australian Federation of Ukrainian Organisations earlier this week said the company was "selling out to those who have little regard for Australian values" and "who stand accused of shooting down MH17". Ms Yusyiuk said people taking up the offer would also discover a very different Crimea to that which existed two years ago. "I don't think the tourists that will be travelling there will be very happy," she said. "At the moment people are not secure. Nobody can guarantee their security." Gateway Travel has said the tours are "non-political", adding that Crimea "belongs to Russia at the moment". The Department of Foreign Affairs and Trade continues to advise against all travel to Crimea due to "very high risk". It warns that regular travel insurance policies would be void and the Australian government is unlikely to be able to provide consular assistance. Gateway Travel said it always warned would-be travellers of the government's travel advice.